If you are a lover of golf, spectacular scenery, and beautiful homes with amenities, the residences at Bighorn Golf Club are some of the most gorgeous properties in the Coachella Valley. With two unbelievable golf courses sporting features and amenities beyond belief, this is a neighborhood anyone, golf lover or not, would love to live in. One word describes Bighorn Golf Club; Beauty. Beautiful vistas, beautiful golf, and beautiful homes are abundant. Not only is it beautiful, everything you need is within minutes from your home. As far as the golf goes, Bighorn Golf Club offers two championship 18 hole golf courses, the Mountains course designed by Arthur Hills and the Canyon Course by Tom Fazio. Both courses are well known and have been the venue for many televised tournaments. There is a huge fully appointed clubhouse with amazing views, the pro shop has been awarded amongst the top 25 private shops for the last seven years and there is a five star fine dining restaurant on site. Golf hosts are available daily and there are four driving ranges, not to mention four golf pros on staff! There is also a junior golf program available. Not into golf? No problem. Bighorn Golf Club has plenty of other activities to keep you busy. There is a tennis program featuring; professional lessons, weekly clinics, and tournaments. For work out buffs there is a gigantic fitness center which comes fully adorned with a spa and salon. There is even a wine and culinary program you can take part in. There are numerous seasonal events to keep you active at Bighorn Golf Club as well, with weekly e-mail blasts to keep you abreast of all the happenings. Talk about convenience. Bighorn Golf Club has it all. Need to get somewhere in a hurry? Just call up the private club limousine to take you to the private jet service, and away you go! Bighorn Golf Club’s multiple dining venues will keep your palate happy with all their delicious menu items. If you’re a pet lover, you will love the dog park complete with two separate areas; one for big dogs and one for little dogs. The convenience doesn’t end there, in the Bighorn Golf club community you get roaming private security, 24 hour manned gates, trash and recycling removal, cable service, and common area maintenance. There really isn’t much you don’t get. All this is here in this beautiful setting. You owe this to yourself. 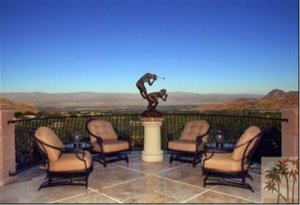 Come see what Palm Desert Luxury Real Estate is all about at Bighorn. If you would like to see property at Bighorn in Palm Desert, please call us at the numbers below. We’re committed to helping you find the home of your dreams.